A few weeks ago, I shared my Halloween Table with you. I’m always on the look out for fun, inexpensive ways to present my place cards. 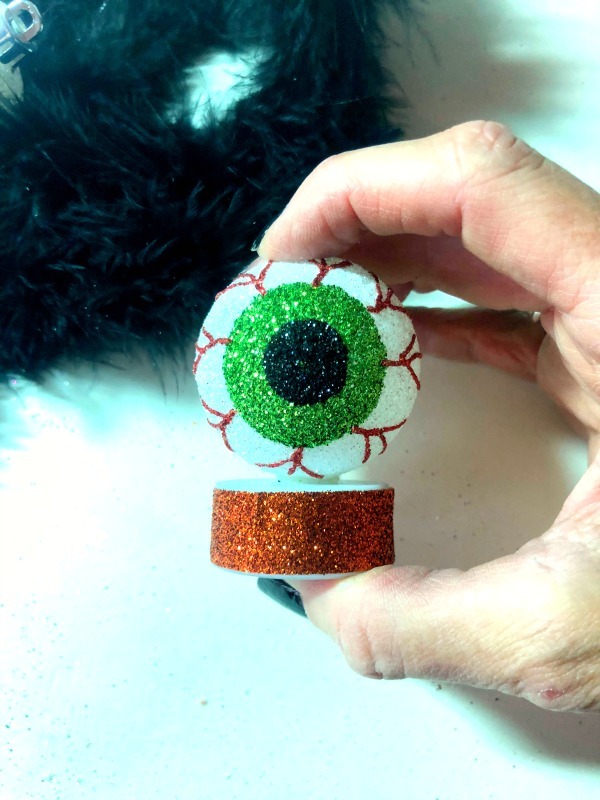 This year, I found what I think are some really fun and easy Halloween Place cards. 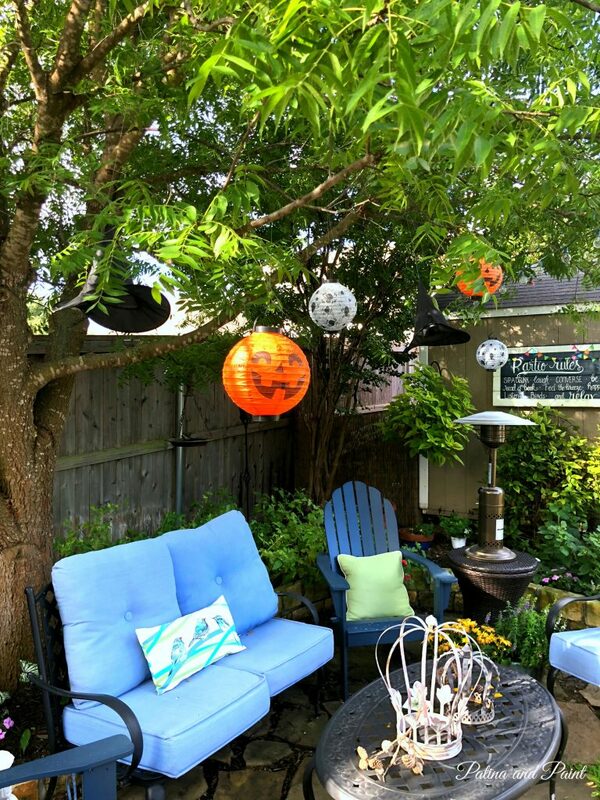 They light up and are super easy to make! Oh, and did I mention that it’s also Ten on the 10th? If you are new here, that’s where Ten fun bloggers share fun ideas, under $10.00 on the 10th of the month! 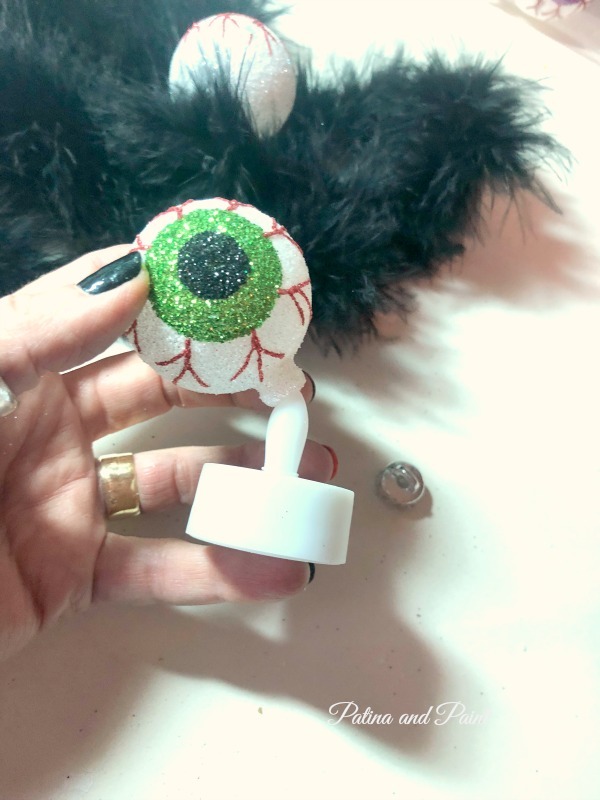 I found these super cute light up, totally blinged out eye balls while shopping recently. Immediately, I knew they were coming home with me to be my new place card holders. Until, I saw the price. While not terribly over priced, they were a bit more than I wanted to spend on something so kitchy. I needed 8 and that would have put me well over $60.00. 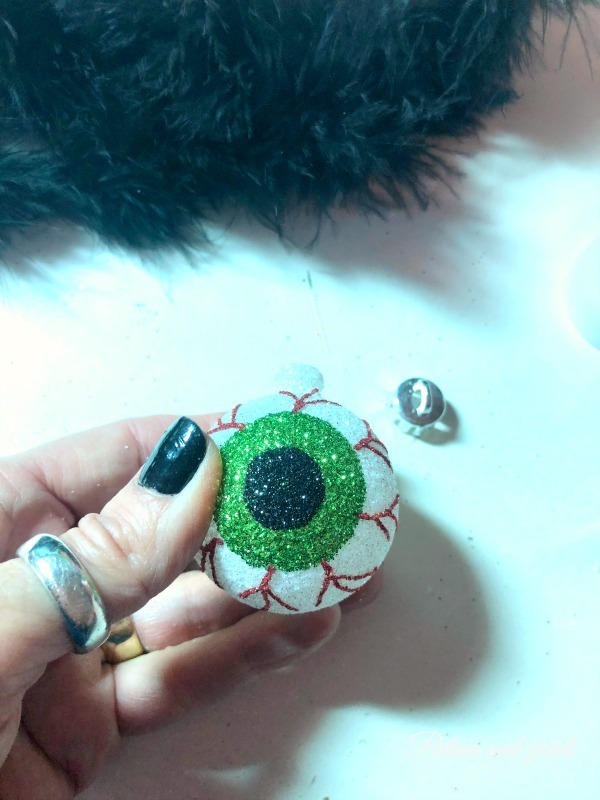 Then, I remembered that on a recent trip to Michael’s I saw eye ball ornaments. 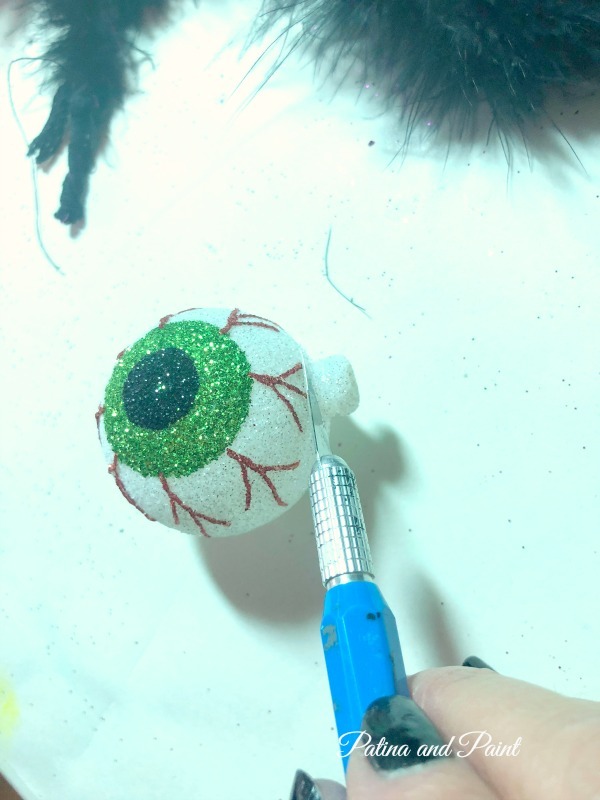 Could I make these light up eye balls? 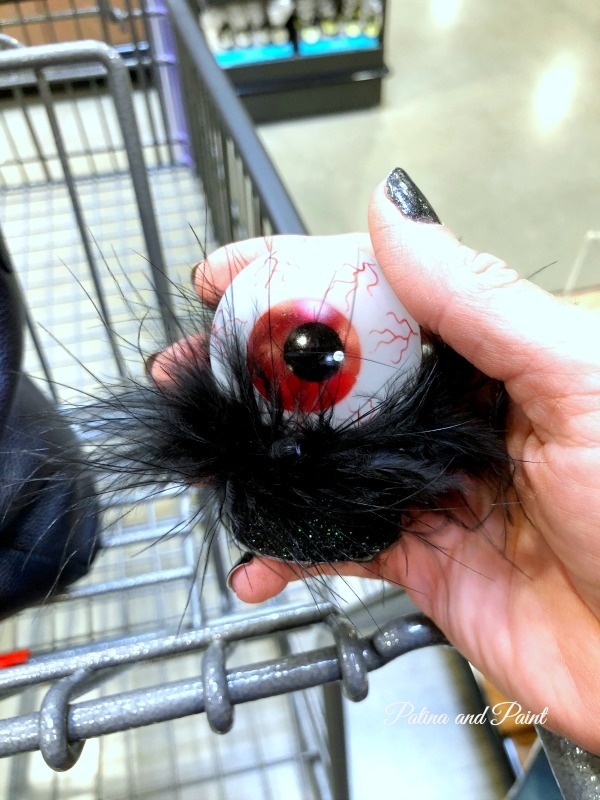 I found 6 eyeball ornaments for 5.99, which were discounted 40%. The boa came from the Dollar Tree, where everything is $1.00. Luckily, I had everything else that I needed in my craft room. Sorry about the photo quality, it’s been raining constantly which makes for really weird photos in my craft room! First things first, remove the silver cap from your ornament. Since my ornaments didn’t slide onto the tea light easily, I needed to make an adjustment. So, I simply cut off the top of the ornament. I used a craft knife, but later figured out super sharp scissors worked just as well. 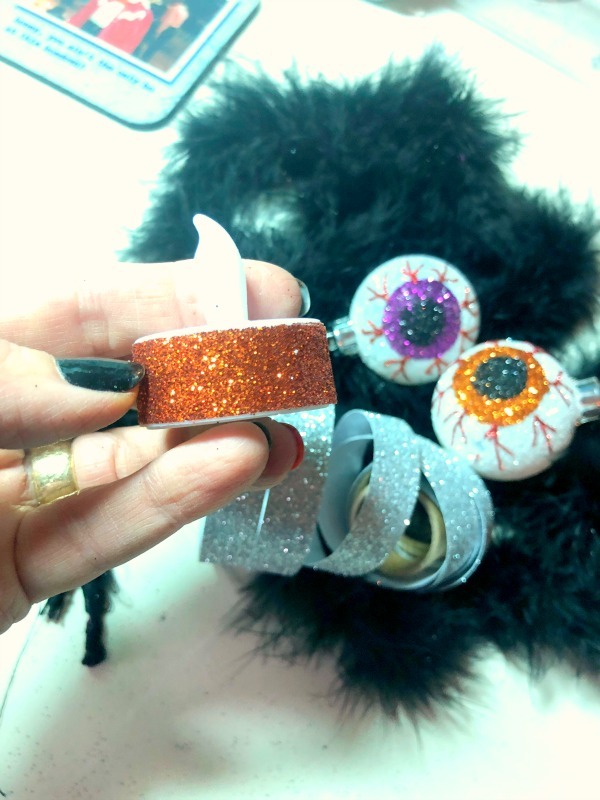 Before placing my ornament onto the tea light, I wrapped the tea light in glitter washi tape. Luckily, I had the tape in my growing stash! Next, I slipped the ornament onto the tea light. 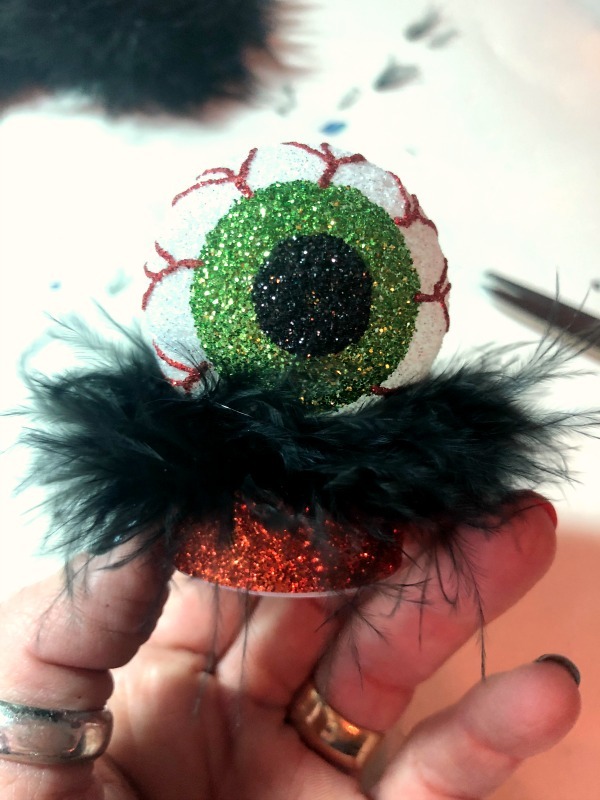 If your ornament doesn’t fit tightly, you may want to use a small amount of hot glue to ensure that the ornament stays in place. Next, I added about 3 inches of boa around the base of the ornament. And last, I tied on the place cards to my light up ornament. 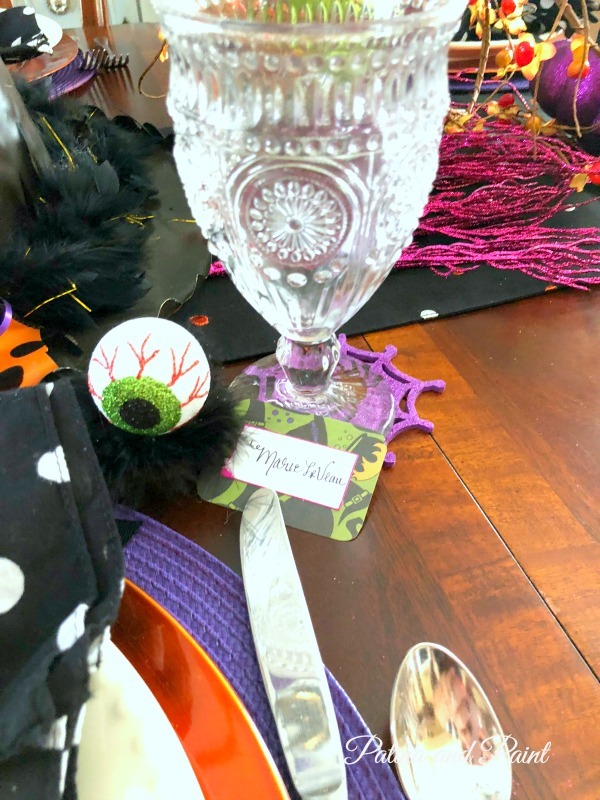 These fun and easy Halloween place cards are super cute, but during the night they add a spooky little glow to the table that is just too fun. 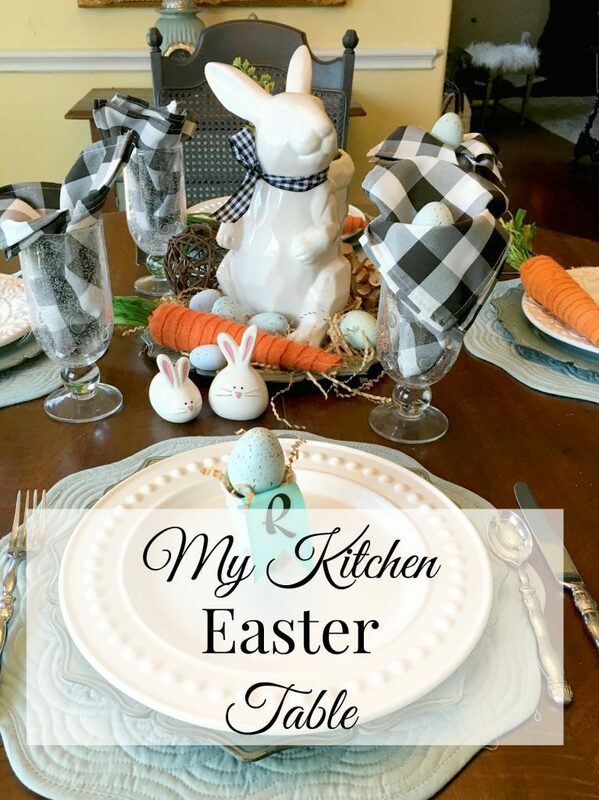 Please join me in checking out my fellow Ten on the 10th friends and see what wonderful ideas they have this month! This is SO clever!! 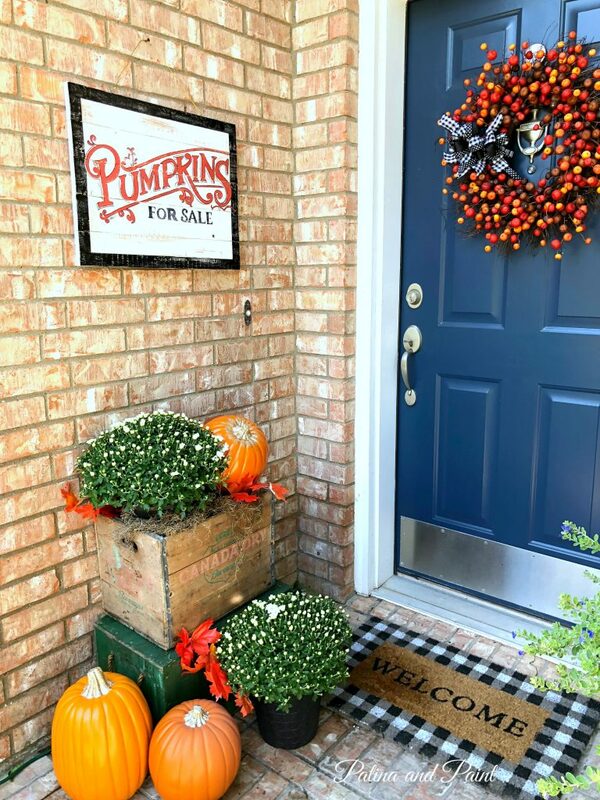 I imagine you can also do something similar with a Christmas ornament, too! I love how you made them light up, what a great mind you have!! This is so creative. How stinking cute. 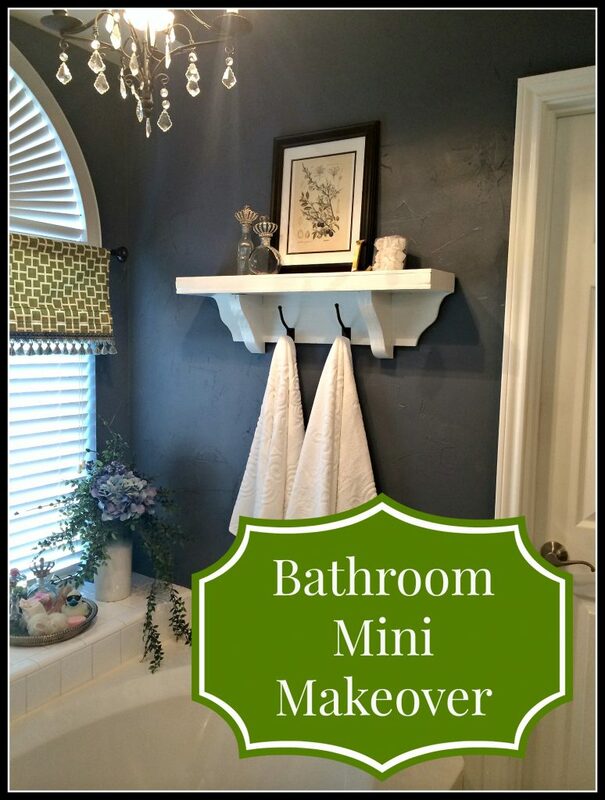 Oh my gosh, I love these and I love how your crafty brain works. I would’ve walked away with that price tag, too, but I’m not sure I would’ve been able to mastermind my own. Fabulous…and ps…love your thumb ring!! Okay, those are adorable. This, coming from a glitterphobe! Rita I tried to keep the glitter to a minimum on this one.. although I have tiny boa hair all over my work table! 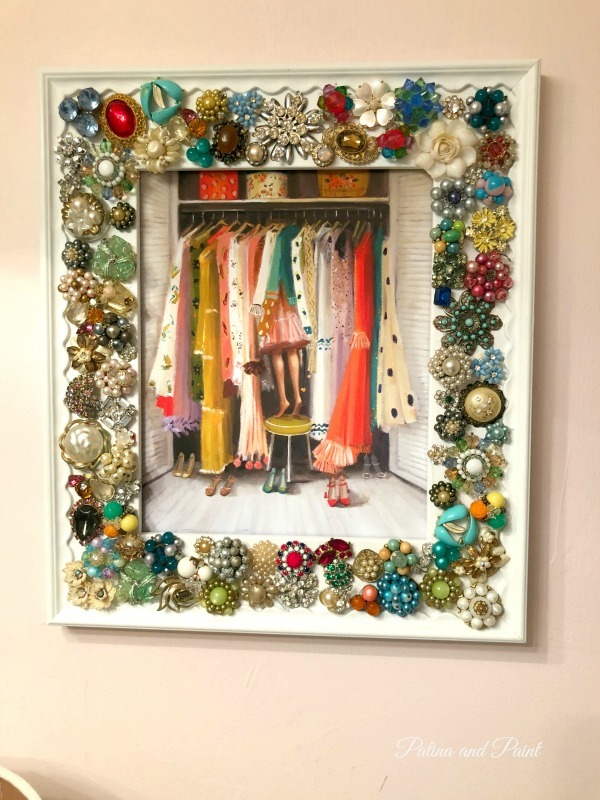 Your projects are always so perfectly done and your sense of color is amazing! This is truly an original idea Tammy! I’ve never seen anything quite like it and I bet it would spook anyone who sat down to have a meal at your table. How much fun! You are so creative and I like yours better than the $60 version. Thanks Eilis, I have to say that I do like the glittery ones too. I guess it was a happy coincidence! Oh my goodness, these are so darling! I have a feeling it must be really fun at your house! Thank you Stacey, I have to admit that there is always something going on here! I wouldn’t have it any other way.